Goff completed 19 of 38 pass attempts for 229 yards and one interception during Sunday's 13-3 loss to the Patriots. 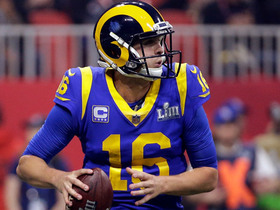 Goff completed 25 of 40 passes for 297 yards with a touchdown and an interception in the Rams' 26-23 overtime win over the Saints in Sunday's NFC Championship Game. He also rushed three times for 10 yards and lost a fumble but recovered it. Goff completed 15 of 28 pass attempts for 186 yards, adding six rushes for 12 yards during Saturday's 30-22 win against the Cowboys. Goff completed 15 of 26 passes for 199 yards and four touchdowns in Sunday's 48-32 win over the 49ers. Analysis: Goff had an early exit for the second straight week with the Rams winning 45-17, as backup Sean Mannion entered the game in the closing stages of the third quarter. The 24-year-old rebounded the last two games by completing 34 of 50 passes for 415 yards, five touchdowns and no interceptions after a rough three-week stretch to begin December. Los Angeles secured the No. 2 seed in the NFC and will now have a week to rest up before hosting in the divisional round. Goff completed 19 of 24 passes for 216 yards with one touchdown and no interceptions in the Rams' 31-9 win over the Cardinals on Sunday. He also rushed twice for six yards and another score and lost a fumble. Goff completed 35 of 54 pass attempts for 339 yards, no touchdowns and a pair of interceptions in Sunday's 30-23 loss to Philadelphia. Goff completed 20 of 44 pass attempts for 180 yards, no touchdowns and four interceptions in Sunday's 15-6 loss to Chicago. Goff completed 17 of 33 passes for 207 yards with one touchdown and one interception in the Rams' 30-16 win over the Lions on Sunday. He also lost two yards on two rushes and lost a fumble. Goff completed 31 of 49 passes for 413 yards and four touchdowns in Monday night's 54-51 win over the Chiefs. He also rushed four times for six yards and another score, but lost two fumbles as well. Analysis: Goff put together a brilliant display, leading the Rams to a dramatic victory with a 40-yard touchdown pass with under two minutes remaining. Of course, that only came after he accounted for four prior scores, including one on the ground. 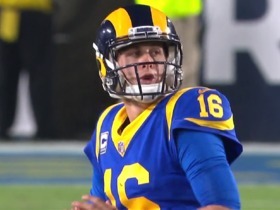 Although his two fumbles prevented a perfect night, Goff otherwise took full advantage of the shootout atmosphere that saw him set career highs in attempts and completions. Goff completed 28 of 39 pass attempts for 318 yards and two touchdowns during Sunday's 36-31 win against Seattle. Goff completed 28 of 40 pass attempts for 391 yards, three touchdowns and one interception during Sunday's 45-35 loss to the Saints. He also carried three times for 17 yards. Goff isn't expected to miss any time after taking some hard hits during Sunday's 29-27 win over the Packers, ESPN.com's Lindsey Thiry reports. Analysis: Goff may show up on the Week 9 injury report, but there isn't any reason at the moment to worry about his availability for Sunday's game in New Orleans. He'll hope to get top red-zone threat Cooper Kupp (knee) back in the lineup, after completing 19 of 35 passes for 295 yards and three touchdowns in a narrow win over the Packers in Week 8. Goff was spotted entering the X-ray room after the game, but it isn't clear if he actually had any tests done. Goff completed 19 of 35 passes for 295 yards and three touchdowns during Sunday's 29-27 win against the Packers. Goff completed 18 of 24 pass attempts for 202 yards and two touchdowns during Sunday's 39-10 win over the 49ers. Analysis: Goff completed an impressive 75 percent of his passes while connecting with seven different receivers. His team led comfortably for most of the game and didn't exactly press him into action, but he still delivered a serviceable fantasy performance thanks to touchdown passes to Brandin Cooks and Todd Gurley. Goff should have a chance to shoulder more of the load next Sunday against the Packers in what could be a high-scoring affair. Goff completed 14 of 28 passes for 201 yards with one interception during Sunday's 23-20 victory over the Broncos. He also carried four times for 14 rushing yards. Goff completed 23 of 32 passes for 321 yards with one touchdown and a pair of interceptions in Sunday's 33-31 win at Seattle. He added five carries for 15 yards. Analysis: A week after putting up career numbers, Goff made some nice throws in a tough environment, although Todd Gurley did most of the scoring with three rushing touchdowns. The Rams rolled the dice late in the game, going for it on 4th-and-one around midfield, and Goff responded with a couple of yards on a quarterback sneak to ice the game. Both Brandin Cooks and Cooper Kupp left the game with a concussion, so that is something to monitor heading into a Week 6 road game against the struggling Broncos. 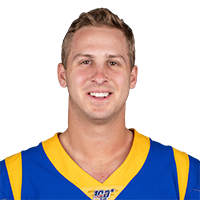 Goff completed 26 of 33 passes for 465 yards with five touchdowns and no interceptions in the Rams' 38-31 win over the Vikings on Thursday night. He also rushed twice for seven yards. Goff completed 29 of 36 attempts for 354 yards with three touchdowns and an interception in Sunday's 35-23 win over the Chargers. Analysis: Goff started off hot, completing 15 passes for nearly 200 yards in a little over a quarter of action. 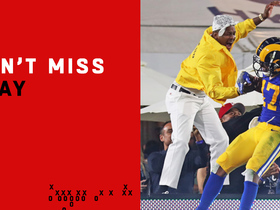 He did make a mistake in the second quarter, however, tossing an interception in the end zone. Goff's touchdown rate is on pace from last season, but his passing yardage is way up so far, averaging over 300 yards per game. In an elite offense with a plethora of playmakers, Goff should continue to put up good numbers, and he'll look to do so Thursday against the Vikings. Goff completed 24 of 32 passes for 354 yards with a touchdown and an interception in Sunday's 34-0 win over the Cardinals. Analysis: Goff nearly finished his uber-efficient outing without a touchdown before connecting with Tyler Higbee on a short scoring pass late in the game. Todd Gurley accounted for the Rams' other three TDs despite averaging just 2.2 yards on 19 carries. Goff has picked up right where he left off last season, already showing better chemistry with Brandin Cooks (159 yards) than he ever did with Sammy Watkins. The Rams have a Week 3 home game against the Chargers. Goff completed 18 of 33 passes for 233 yards and two touchdowns without an interception in Monday's 33-13, Week 1 win at Oakland. Analysis: Goff had just seven completions with less than two minutes left in the third quarter, but he exploded for 55 yards on his next three passes, including an eight-yard touchdown to Cooper Kupp to break a 13-13 tie on the last play of the quarter. He also had a 19-yard touchdown pass to Todd Gurley in the first quarter and showed a good rapport with offseason addition Brandin Cooks, who finished with a team-high 87 receiving yards on five catches. Goff won't play Thursday's preseason finale against the Saints, Lindsey Thiry of ESPN.com reports. Analysis: Goff didn't need to prove anything, but it's odd he wasn't used at all this preseason. Fantasy owners should be itching to see how well Goff and Brandin Cooks jell in a live game. Nevertheless, the third-year pro will be ready to take on Oakland in the season opener and look top his Pro Bowl performance from last year. Goff will not play in Saturday's preseason game against the Texans, Myles Simmons of the Rams' official site reports. Analysis: It appeared Goff was set to play early in the week, but head coach Sean McVay later changed his mind and eventually decided to rest nearly all of the offensive starters Saturday. Goff may have played his last down of the preseason already, but he'll retake the reins under center when the Rams open the regular season with a Week 1 Monday night game against the Raiders. Coach Sean McVay said Goff may not suit up for Saturday's preseason contest against the Texans, Lindsey Thiry of ESPN.com reports. Goff will play in Saturday's preseason game against the Texans, Clarence Daniels of the Rams' official website reports. Analysis: Goff was held out for the first two exhibition games and probably won't get a ton of playing time in this one. The lack of in-game reps shouldn't be an issue, however, considering Goff is largely surrounded by the same supporting cast from last season, with the exception of swapping out downfield threat Sammy Watkins for Brandin Cooks. Goff and some other starters may be held out of the Rams' second preseason game Aug. 18 against Oakland, Lindsey Thiry of ESPN.com reports. Analysis: The Rams will face the Raiders again in Week 1 of the regular season, creating a situation that coach Sean McVay acknowledges to be "tricky". With Brandin Cooks standing as the only major addition on the offensive side, McVay probably believes Goff and the other key players don't need many reps during the preseason. The starters may need to wait until Aug. 25 against the Texans to get significant run. Goff could be held out of Thursday's preseason opener against the Ravens, Rich Hammond of the Orange County Register reports. Analysis: Rams coach Sean McVay may elect to keep Goff sidelined during the team's first preseason contest in order to avoid any injuries to his starting quarterback, which would remove him from consideration in DFS formats Thursday. If this is the case, the trio of Sean Mannion, Brandon Allen and Luis Perez figure to split reps at the helm as they compete for the primary backup spot at QB. From the sounds of it, a number of the Rams' top players could be sidelined as a precautionary move Thursday. Rams coach Sean McVay is confident Goff will continue to develop in 2018, despite losing former offensive coordinator Matt LaFleur to the Titans and former quarterbacks coach Greg Olson to the Raiders, Myles Simmons of the team's official website reports. Goff completed just 24 of 45 passes for 259 yards and a touchdown during Saturday's 26-13 loss to Atlanta in the wild-card round. Goff will replace Sean Mannion as the Rams' starting quarterback for Saturday's wild-card matchup with the Falcons, Rich Hammond of The Orange County Register reports. Goff, who is active for Sunday's contest at Philadelphia, isn't expected to see the field, Kristen Lago of the Rams' official site reports. Analysis: Teams are limited to placing a maximum of seven players on inactive lists, so the Rams deactivated absolute certainties like Todd Gurley, Aaron Donald and Andrew Whitworth. 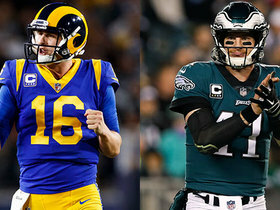 Nonetheless, head coach Sean McVay will hand backup QB Sean Mannion the keys to the offense Week 17, meaning Goff will be toting a clipboard for the entirety of this contest. Goff will be held out for Sunday's regular-season finale against the 49ers, Rich Hammond of the Los Angeles Daily News reports. Rams head coach Sean McVay suggested Tuesday that Goff and several other key starters could be rested for the regular-season finale Sunday against the 49ers, Alden Gonzalez of ESPN.com reports. Goff completed 22 of 38 passes for 301 yards and four touchdowns while losing one of two fumbles in Sunday's 27-23 win over the Titans. Goff completed 14 of 21 pass attempts for 120 yards, two touchdowns and an interception in Sunday's 42-7 trouncing of the Seahawks. Analysis: The Rams took advantage of multiple Seahawks turnovers and subsequent short fields to run up a 34-0 lead at the half. Goff would only attempt five passes in the second half before being relieved by Sean Mannion early in the fourth quarter. Nevertheless, the second-year pro completed two touchdown passes for the fourth consecutive game despite season-low pass-attempt and yardage totals. He'll have a much more promising matchup Week 16 at Tennessee. Goff completed 16 of 26 pass attempts for 199 yards and two touchdowns Sunday against the Eagles. He also carried two times for two yards and lost a fumble in the 43-35 loss. Goff completed 21 of 31 passes for 220 yards, two touchdowns and one interception during Sunday's 32-16 victory over the Cardinals. Goff completed 28 of 43 passes for 354 yards, two touchdowns and one interception in Sunday's 26-20 win against the Saints. Goff completed 23 of 37 passes for 225 yards without any touchdowns or interceptions in Sunday's 24-7 loss to the Vikings. He's also gained eight yards on two rushes. Goff completed 25 of 37 passes for 355 yards and three touchdowns in Sunday's 33-7 win over the Texans. Goff completed 14 of 22 pass attempts for 311 yards and four touchdowns in Sunday's 51-17 win over the Giants. 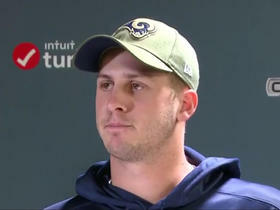 NFL Network Insider Ian Rapoport discusses the latest on the Los Angeles Rams' contract talks with quarterback Jared Goff. 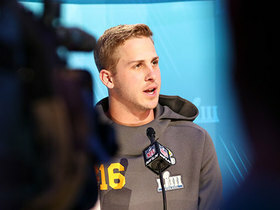 Los Angeles Rams quarterback Jared Goff reacts to his team's Super Bowl LIII loss to the New England Patriots. 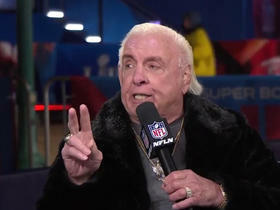 WWE legend Ric Flair joins "NFL Total Access" to talk about the upcoming Super Bowl LIII matchup between the New England Patriots and Los Angeles Rams. 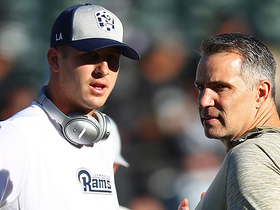 NFL Network's Kurt Warner catches up with Los Angeles Rams quarterback Jared Goff at Super Bowl LIII Opening Night. 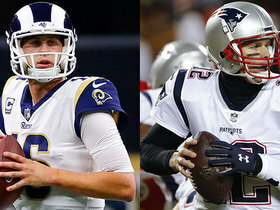 NFL Network's Michael Robinson breaks down the similar throwing mechanics of Los Angeles Rams quarterback Jared Goff and New England Patriots QB Tom Brady. See the best plays from Los Angeles Rams quarterback Jared Goff during the 2018 regular season. 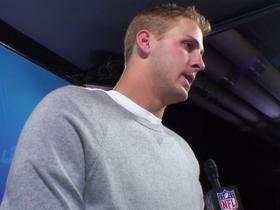 Los Angeles Rams quarterback Jared Goff addresses the media ahead of his first NFC Championship Game against the New Orleans Saints.